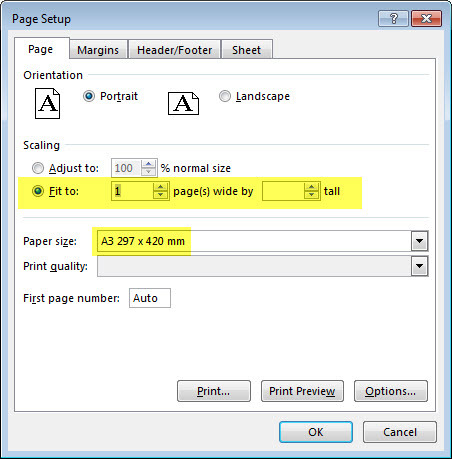 Excel’s built-in “Fit to” option in the Page Setup (see image below) only decreases the print zoom % because most sheets are too big to fit on a single A4 page at 100%. There is no functionality to increase the zoom % to make the sheet expand to fill a single A3 page. Instead of using trial and error or manually increasing the zoom percentage, we can create a macro to do the work for us. 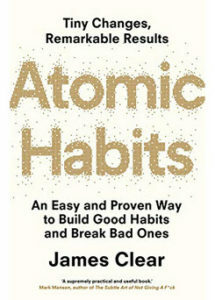 The sequence we will follow is shown below. 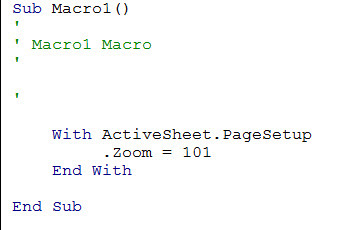 Record a macro to change the zoom (scale) percentage to discover the code required. Do a Google search to identify code to return how many pages are being printed on the active sheet. Amend the code to progressively increase the zoom percentage until we end up with more than one page printed. Reduce the zoom percentage to go back to one page. Handle the maximum limit of the zoom %. Use debugging code to see why the code isn’t working. Record another macro to change the View (explained further below). Tweak the code to make sure the number of pages updates. A file with the final macro can be downloaded at the bottom of the post. Note: this may not be the most efficient macro but it works. Even experienced macro writers regularly use the macro recorder. The macro recorder gives you the code you need, quickly and easily. You can then amend the recorded code to do what you want. When you record a macro that does anything that involves printing you end up with a lot of VBA (Visual Basic for Applications) code. The screen shot below shows you the amount of code you get when you simply change the zoom percentage – I changed the zoom % on the Page Layout ribbon (see screen shot overlay – top right). The Page Setup dialog interacts with your printer and that requires communications over your network. This impacts the speed of the macro. 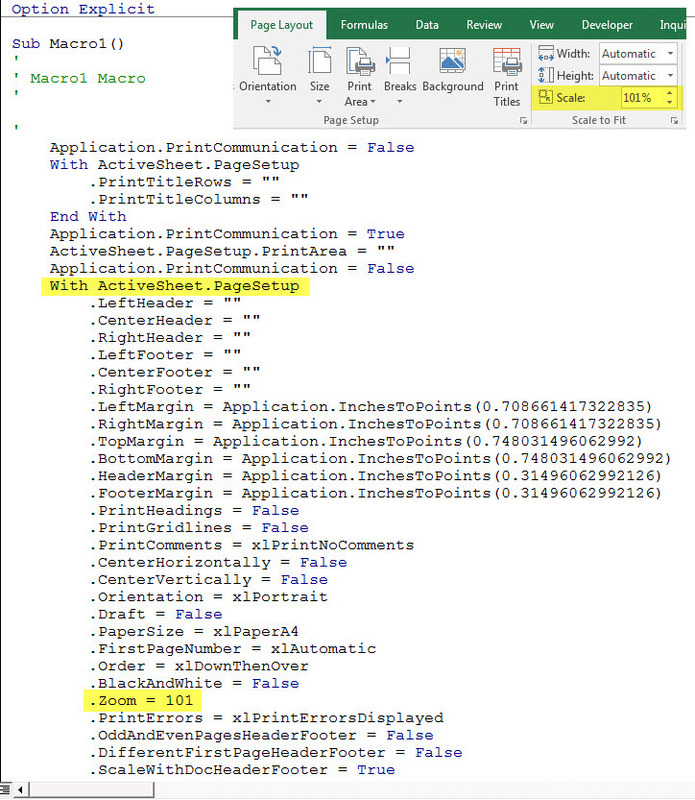 In general when you record a macro that involves the Page Setup dialog you should eliminate unnecessary lines of code because each line of code may require communication to the printer and slow the macro down. In most cases when you record a macro, extra lines of code don’t necessarily slow the macro down very much, but when they involve the Page Setup dialog they usually do. Because of the speed issue you need to scan the recorded code to find the zoom percentage change. I then did a Google search to identify the code that tells us how many pages are printed. I came across a few pieces of code. I decided to use the Excel 2007 piece of code. I then created the following piece of code that uses a Do Until Loop to increase the zoom percentage until the pages to print is greater than one. This Do Loop will keep increasing the zoom % by 1 until it causes the number of pages to exceed one or the zoom % equals 400. 400 is the maximum value for the zoom %. Trying to go above 400% will cause an error. Below the Do Until Loop in the code I reduce the zoom percentage by one which should put the number of print pages back to one page before it went over to two. When I ran the code it didn’t work! The zoom % had stopped at 399% (400-1). What to do? It should work, why doesn’t it? 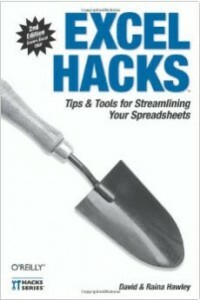 I used the Debug.Print command to monitor the number of pages that were being identified with each increase in zoom %. Debug.Print prints to the Immediate window in the VBA screen. You can capture values as the code is running. To get to the VBA screen press Alt + F11. To display (or hide) the Immediate window press Ctrl + G in the VBA screen. I added this line of code to the loop under where I increment to zoom %. I ran the macro and checked the Immediate window. As you can see the number of pages didn’t change even though the zoom percentage had increased to 400. Why? 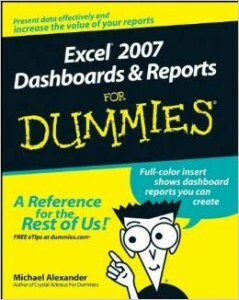 Excel didn’t seem to be updating the number of printed pages. In Excel you sometimes need to trigger an event to force Excel to do a calculation. I then thought of the Page Break Preview View (that’s the View that displays the non-printing areas as grey). That View shows the print with the page breaks. I thought if I change between the Normal (grid) View and the Page Break Preview View Excel would update the number of pages printed. I recorded another macro to change between Views – see below. I then added the code to switch between Views to the macro and it worked. I have added comments (green lines) to the final code below to explain all the parts of the code.